CITY OF INDUSTRY, Calif. – Utility Trailer Manufacturing touted a pair of new products the company announced last year that are hitting the road in 2017. 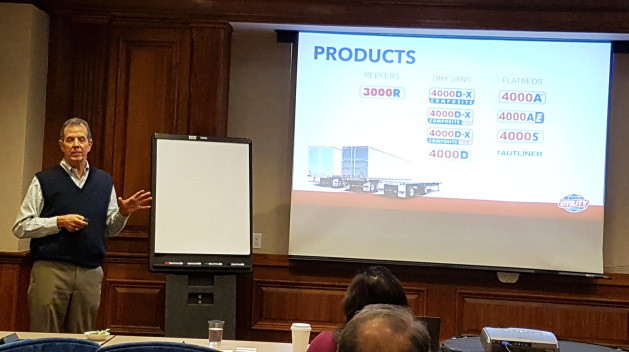 The trailer manufacturer invited the press, including Truck West, to City of Industry, Calif. Jan. 25 to talk about the 4000D-X Composite TBR and the 4000 AE trailers, as well as discuss its house-made side skirts, a business review of 2016 and an outlook of the year to come. Craig Bennett, senior vice-president of sales and marketing for Utility Trailer, said the new 4000D-X Composite TBR is constructed to withstand abuse with transporting dry freight. With a testing facility in California, Bennett said the company puts all its trailers through a rigorous test prior to selling the product to its customers, something he said puts Utility Trailers ahead of the pack when it comes to reliability. “Years ago, people would build trailers and they would design them and put them out and if there were problems they would rely on the customer to say there’s a problem, and we don’t want that to happen,” said Bennett. The 4000D-X Composite TBR is engineered for heavy hauls that often incur a great deal of abuse during loading and unloading from machinery such as forklifts. The trailer features a new heavy-duty tall bottom rail (TBR) that is 10” taller and 50% thicker at floor level than a standard bottom rail, and eliminates fasteners from the bottom rail. It also has riveted structural components, which have been raised above the pallet impact, rub and work level, including the wearband, which Bennett said has been reduced from 12” to 8” tall. The trailer boasts an upgraded payload from 16,000 to 20,000 lbs, and interior dimensions have been slightly increased, measuring 101.25” lining-to-lining, 101” wearband-to-wearband and 101.75” rail-to-rail. The newest member of the 4000D-X Composite Series, Bennett said the TBR is lighter weight than the competition and will have lower maintenance costs and lower total cost of ownership. “We have dealers now that are saying to us that this is going to be their standard trailer,” said Bennett, adding that several fleets are converting from the standard D-X to the new TBR trailer. Utility Trailer also highlighted its new 4000AE flatbed, a combo trailer made with both steel and aluminum, but made lighter with the use of 3” and 4” aluminum crossbars. Bennett said changing from steel to aluminum crossbars save 536 lbs compared to the 4000A base model, and 627 lbs from the 4000A with a coil package. Due to its need to flex more so than dry and reefer vans, Bennett said the use of aluminum crossbars with the newly-implemented 3” and 4” design result in a product better capable to withstand that type of stress than steel competitors. Nine 4” aluminum crossbars taper at the end to 3”, and are full width on the 8” centerline. The 4000AE has an all-aluminum floor with a few nail strips proportioned throughout and comes with a standard 47,000 lbs coil haul package. “Utility is one of the few trailer companies that design their own side skirts,” Bennett confirmed, saying the reason the company originally went in that direction was that skirts made by other manufacturers fell off, and there was a need to develop a product that best suited the trailers Utility was putting on the road. Side skirt enhancements include a bolted spring-shaped bracket that provides flexibility while maintaining a secure attachment to support leg wingplate, a bracing system for skirt flex inward and outward, fiberglass reinforced plastic construction with UV protection and a new one-piece design to reduce weight and add durability. The new skirts weigh approximately 25-30 less than the previous model. The company’s side skirts will include a warranty package – the Ultra Road Shield Plus to protect customers against corrosion for up to 10 years. Much of Utility Trailer’s production of side skirts has been driven by the US government’s regulations on greenhouse gas (GHG) emissions, and there is a new Environmental Protection Agency (EPA) GHG Phase 2 regulation coming down the pike, which Bennett said will regulate fuel economy from both the tractor and trailer at the same time, a departure from regulating the propelled vehicle. “Last time I checked, a trailer is not a self-propelled vehicle,” Bennett said, raising concern that the same formula will not work for every tractor-trailer combination, and the fact that testing was done at 62 mph, when most tractor-trailers combos travel around 45-50 mph. Bennett said the company would wait and see what the new Trump administration did with regards to the EPA regulations before making any decisions when it came to side skirts, but added that the company is environmentally conscious. Utility Trailer had a near record year in 2016, with a company share of 41% for dry vans, 55% for reefers and 4% for flatbeds and tautliners, equating to 15.6% overall market share for the year, down from 16% in 2015, which was the company’s best year from a market share perspective. “That’s a really healthy number, we’re building a lot of dry van trailers,” said Bennett. The company also expanded its dealer network, including the opening of a new full-service location in Moncton, N.B. With 113 dealers in the Americas, 9% are in Canada, 83% in the US and 8% in Latin America. Bennett said the marketplace is growing, but company forecasting for 2017 is down from 2016, largely due to a projected drop in the dry freight market. “Nothing is dropping off a cliff like it did in 2009,” Bennett said, point to 2009 and 2001 as the company’s worst years, which both coincided with US recessions. Bennett said Utility Trailer has been on an upward trajectory for the last six years, and despite 2017 being projected as a down year, the trailer business is still good, but could be better if global manufacturers where all held to the same standards.